The zombie genre is versatile and has many branches, and these can be twisted and pulled to form canvases for many types of film. Whether it's horror, comedy or action, the undead can find their place. A popular slant of late is the zom-rom-com, which is where Jeff Baena's debut feature 'Life After Beth' can sit comfortably. The eponymous Beth is played by US comedy actress Aubrey Plaza and the plot surrounds her death and the grief caused by it, both to her family and doting boyfriend Zach (Dane DeHaan), whose mourning is interrupted by her unexpected return. This modern take is lifted by some excellent performances, and is written and directed with care, focusing in on an amusingly doomed relationship as Zach now not only loves Beth, but is scared of her too. Unlike other zombie movies in which victims seem to transform instantly into blood-thirsty monsters as soon as they're infected, here our expectations are toyed with as we are presented with Beth's slow transition from sweet girl-next door with a love for long walks to a gibbering maniacal mess. This drawn-out trajectory allows a steady establishment of setting and characters and we build a rapport with heart-broken teen Zach before his love-life takes a bizarre turn. DeHaan and Plaza take their complicated roles in their stride, the former playing 'the straight guy' note perfect as the latter goes completely bonkers. Not known for humour, Dane DeHaan continues to impress and is surely set to become one of the most in-demand names in the industry. Plaza brings a consistent aura of unpredictability to her performance which is forever fascinating. The supporting cast provide a richness to the piece, in particular comedy veterans John C. Reilly and Cheryl Hines who are the protective parents of the piece, have the funniest lines of the lot. In its progression, Baena bites off more than he chew so to speak, as when the proceedings inevitably descend into chaos, the originality begins to fade. The physical comedy used as the story develops does result in one or two big laughs but the indie spark fizzles out as the ridiculous verges on being a little too silly. 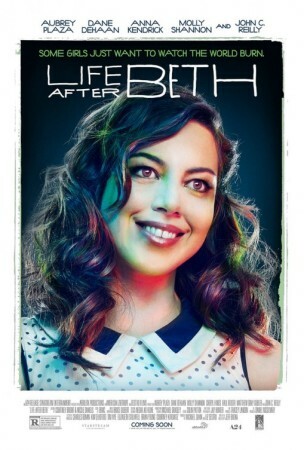 'Life After Beth' has a unique edginess in its field, and while the complexities of the characters are charming and interesting, overall it lacked the defibrillation required to really come to life.